With relatively little still known about why and how sharks use shallow environments, researchers say there is promising potential for using unmanned aerial vehicle (UAV) technology to better understand shark behaviour in areas where human interactions occur, such as beaches. Marine ecologist Dr Vincent Raoult says the movement tracking techniques provide a cost-effective and non-invasive option to gather data that are otherwise difficult to obtain. “A slow rise in the number of global shark-human interactions has led to calls for a greater understanding of shark behaviour in areas where these encounters are likely to occur,” Dr Raoult said. “Currently, researchers rely on acoustic or satellite tags to gather movement data on sharks and other marine vertebrates. These methods are expensive, cause stress to the animals and only capture environmental factors such as depth and temperature. The small-scale study successfully tracked 14 sharks at Heron Island on the Great Barrier Reef, including nine Epaulette sharks and four Blacktip Reef sharks, for three to eleven minutes. Researchers manually piloted the drone within the scientific zone to track sharks in real time, analysing the recorded footage in more detail after each event. 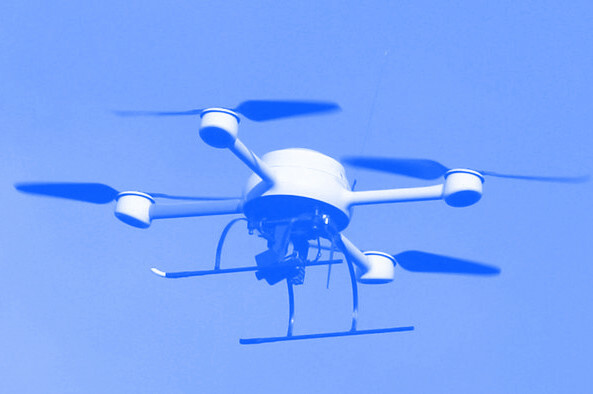 Movement and speed were calculated at multiple times per second using the on-board GPS built in to the drone, returning significantly greater accuracy than acoustic tracking. The findings also challenged previous assumptions about the feeding habits of Epaulette sharks. “Epaulette sharks are generally thought to not move much during low tides, however, we found they were highly lively during these times and were actively looking for food across relatively wide ranges,” Dr Raoult said. “Observations of natural feeding events like this are quite rare, which suggests this approach might be a great tool to learn more about natural feeding behaviours as sharks did not appear to be bothered by the drone. While UAV’s have recently been used for other marine behavioural studies, innovative applications of drone technology for ecological applications are likely to continue to evolve over the coming years. “Larger data sets are required to confirm these initial findings, but this study demonstrates that UAV-based tracking is a tool that could allow us to understand and predict movement and behaviour patterns on a larger scale and for a wide range of marine species,” Dr Raoult said.